This piece previously appeared on the WGBH Social Media Portal. The launch of Facebook Watch and expansion of Twitter’s character limit were the big headlines this month, but there there many more changes to social platforms this month that will have an impact on your strategies. Take a look at the top 25 changes from September. 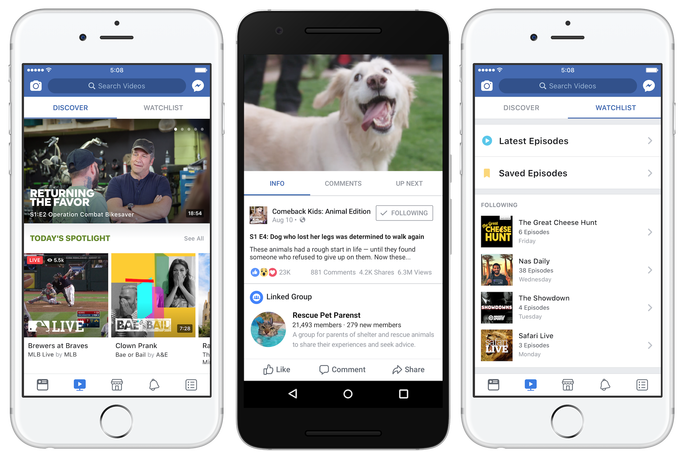 Facebook Watch, Facebook’s hub for original video content, rolls out to all users. Twitter is testing an expansion to its character limit – doubling the space allowed from 140 to 280 characters – for a select group of users. You can now view Instagram Stories on instagram.com on desktop. As a way to increase visibility of the “Stories” format on Facebook, the platform is allowing users to share their Instagram Stories on Facebook. Facebook introduces new tools to the Live API, including improved ability to see exactly when you’re going live (no more guessing by checking your own feeds!) They also created a great landing page where producers can schedule their Facebook Live streams. Twitter tests an in-app Tweetstorm feature where users can create longer threads before sending out the first tweet in the series of posts. Instagram updates its Business Profiles API to allow moderation of comments, technical support and more robust analytics tracking. Twitter “Teams,” which allows multiple users to manage a single account, is now available on the Twitter mobile app. Apple News introduces a curated video section around categories like business, sports, and breaking news events. Facebook introduced the Canvas ad format to Instagram Stories, letting advertisers use new creative formats such as image carousels and text-based posts. YouTube removes the ability for creators to add external links to cards at the end of videos, unless that creator is a part of the YouTube Partner Program. Facebook turns profile images circular. Pages should review the new look to make sure their old square images convert without cutting off any important real estate. Twitter launches a “Popular Articles” feature that shows users which articles their networks are sharing or engaging with. YouTube discontinues Paid Channels which have been in effect since 2013. These allowed YouTube creators to set their own price for subscriber-only channels. YouTube in doubling down on a sponsorship model for creators. Facebook launches new features for Custom Audiences that allow advertisers to target users based on previous visits to a physical location, phone calls to a call center or in-store purchase history. Facebook introduced changes to its Camera Effects policy, allowing Pages to include logos or watermarks for creative effects like frames. Facebook launches a Snooze button that lets you unfollow friends, Pages or Groups for a limited period of time (24 hours, 7 days or 30 days). The Li.st app, a social network exclusively around user-generated lists about anything, is shutting down. The app will be building a unique archive page for every account before it shuts down at the end of the month. Facebook is offering major record labels millions for the rights to use music in videos posted to the platform. Twitter introduces a “nighttime version” of its desktop app to cut down on bright screens. In light of recent news about the use of Facebook advertising for geopolitical and propaganda purposes, Facebook announces an increase in manual review for ad targeting options. Pinterest offers advertisers the ability to target users using the Taste Graph, a new tool that monitors over 5,000 individual interests on the platform over time. Vimeo debuts live video with Vimeo Live, with new capabilities for creators to create, edit, stream, monetize and store live video from their recent acquisition of Livestream. Facebook announces new cross-platform brand lift measurement solutions to help advertisers optimize their investments across both Facebook and TV.